TOYOTA COROLLA. FOG LIGHTS KIT [complete]. - Kit includes: housings, bezels, wiring, and OE style switch. (w/o factory fog lights). Upgrade for CE and LE trims. All products are covered by our warranty against defects. Hella 500 fog lamp kit part number 005750971 uses Hella's aluminum vapor coated reflector with bonded clear glass lenses. 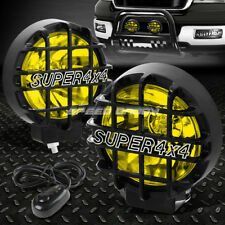 This set of 2 lights will fit most light bars and are compatible with 12V systems. The kit comes complete with wiring harness and an illuminated toggle switch. Auxbeam LED Light Bar Wiring Harness Kit 2 lead 12V 40Amp Fuse Relay ON/OFF New! Auxbeam 2 lead Universal Wiring Harness One Lead. Blade fuse holder with replaceable 30A fuse. 1x wiring loom harness kit with fuse, relay and switch. This wiring harness can be assembled with a DC 24V relay. 5 out of 5 stars - Auxbeam LED Light Bar Wiring Harness Kit 2 lead 12V 40Amp Fuse Relay ON/OFF New! 9 product ratings9 product ratings - Auxbeam LED Light Bar Wiring Harness Kit 2 lead 12V 40Amp Fuse Relay ON/OFF New! One pair, 4D Pod Spot Amber Lens, Black Housing. Beam Pattern: Spot Beam (30° Angle). Cut through dust, fog, snow with our amber lights. Lens: Impact Resistant Polycarbonate. LED Lifespan: 50,000 Hrs. 2010-2019 Frontier Painted Bumper Only. Fog Lights. Polycarbonate Lens with a superior UV protection and a high impact resistance. High quality OE grade materials to withstand the most rigorous weather conditions. MITSUBISHI LANCER. FOG LIGHTS KIT [complete]. - Kit includes: housings, bezels, wiring, and OE style switch. All products are covered by our warranty against defects. - 12 months manufacture warranty. 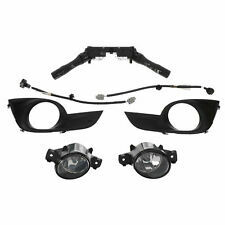 Toyota Tundra 2018 - 2019 Black Finish LED Fog Lamp Set - OEM NEW! Fog decreases visibility and makes it hard to see the road ahead of you, which can make any road trip stressful, scary, and frustrating. Lessen your stress and combat the fog when you install fog and driving lights on your car or truck. If you live in an area where fog is frequent, it pays to be prepared in order to make a safe trip through the cloudy haze. Fog lights are made to minimize the murk and send smog away so you can drive without worry. Investigate the different types of fog and driving lights and don’t let your dusk drive get you down. Light bars are horizontal and can be mounted to provide extra light to a vehicle in need. These bars, also called flood lights or off road lights, are perfect for all types of vehicle, including cars, trucks, boats, and even SUVs. They typically secure to the front of the vehicle, on top of the bumper, and come in many sizes for a perfect fit. Waterproof and weatherproof, light bars are a practical way to increase your sightline in the dark. These are used for off road driving, work situations, nighttime fishing or boating, or driving through extreme weather, including fog. Light bars increase your range of visibility and keep you safe in all types of elements. Made from energy efficient, low heat LEDs, they are long lasting and street legal. Instead of one long light bar, consider two spotlights instead. These look more like regular headlights, but these fog lights are super powered to add more visibility to the road ahead, keeping safety a priority while you’re behind the wheel. Spotlights reduce the glare from snow or fog to create sharper vision in a wider range, so you’re seeing more than you normally would. Typically cube-shaped, these lights are made of small LEDs that combine to create an intense light beam. Many cars don’t come equipped with fog lights that can handle inclement weather, so upgrading to spotlights is a good option for drivers who frequently travel in gloomy weather. 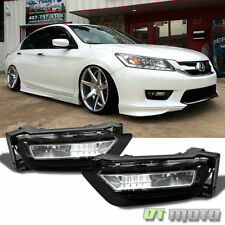 These can mount to the front bumper, or above the hood. Driving lights are like regular headlights that have been working out at the gym. They offer heavy-duty visibility for everyday driving conditions, including fog, and some of them are even brighter than standard fog lights. However, while fog lights and light bars are better on side roads and country gravel, driving lights are more appropriate for the highway. 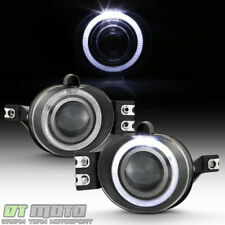 They are more intense than regular headlights, but not as distracting as a light bar or spotlights. Many driving lights are made with HID lights instead of LEDs to provide you with even more visibility on the road, and brighter light. They are also energy efficient, and perfect for all types of weather and elements.